High strength carbon (C) and low alloy steels have yield strength (YS) greater than 275 N/sq mm and can be classified generally in four types namely (i) as-rolled C – Mn (manganese) steels, (ii) as rolled high strength low alloy (HSLA) steels also known as micro-alloyed steels, (iii) heat treated (normalized or quenched and tempered) C steels, and (iv) heat treated low alloy steels (Fig 1). These four types of steels have higher YSs than mild C steel in the as hot rolled condition. The heat treated low alloy steels and the as rolled HSLA steels also provide lower ductile-to-brittle transition temperatures than do C steels. The four types of high strength steels have some basic differences in mechanical properties and available product forms. In terms of mechanical properties, the heat treated low alloy steels offer the best combination of strength and toughness. However, these steels are available primarily as bar and plate products and only occasionally as sheet and structural shapes. In particular, structural shapes (I and H beams, channels, or special sections) can be difficult to produce in the quenched and tempered condition since shape warpage can occur during quenching. Heat treating steels is also a more involved process than the production of as rolled steels, which is one reason the as rolled HSLA steels are an attractive alternative. The as rolled HSLA steels are also commonly available in all the standard wrought product forms (sheet, strip, bar, plate, and structural shapes). HSLA steels are an attractive alternative in structural. High strength steels are used to reduce section sizes for a given design load, which allows weight savings. Reductions in section size are also beneficial in obtaining the desired strength level during the production of structural steel. Whether steels are furnished in the as hot rolled or heat-treated condition, the strength levels tend to decrease as section size increases. In as hot rolled or normalized steel, this results from the coarser microstructure (larger grains and coarser pearlite) that develops from the slower cooling rates on the rolling mill for the thicker sections. In quenched and tempered steels, the lower strengths result since the transformation temperature increases as section thickness increases and the amount of martensite (strongest microstructural constituent) progressively decreases. Thus, as the section size increases, it becomes more difficult to obtain the strength levels characteristic of a particular alloy. Structural C steels include mild steels, hot rolled C-Mn steels, and heat treated C steels. Mild steels and C-Mn steels are available in all the standard wrought forms such as sheet, strip, plate, structural shapes, bar, bar-size shapes, and special sections. The heat treated grades are available as plate, bar, and, occasionally, sheet and structural shapes. Mild low C steels are normally considered to have up to 0.25 % C, of around 0.4 % to 0.7 % Mn, 0.1 % to 0.5 % Si, and some residuals of sulphur (S), phosphorus (P), and other elements. These steels are not purposely strengthened by alloying elements other than C. They contain some Mn for S stabilization and Si for deoxidation. Mild steels are mostly used in the as rolled, forged, or annealed condition and are seldom quenched and tempered. The main type of mild steels has low C (< 0.08 % C with ? 0.4 % Mn) and is used for forming and packaging. Mild steels with higher C and Mn contents have also been used for structural products such as plate, sheet, bar, and structural sections. Before the introduction of HSLA steels, the mild steels were commonly used for the structural parts of automobiles, bridges, and buildings. For rolled structural plate and sections, one of the earliest approaches in achieving higher strengths involved the use of higher Mn contents. Mn is a mild solid solution strengthener in ferrite and is the principal strengthening element when it is present in amounts over 1 % in rolled low C (< 0.20 %) steels. Mn can also improve toughness properties. Earlier strength in hot rolled (HR) structural steels was achieved by the addition of C up to 0.4 % and Mn up to 1.5 %, giving YSs of the order of 350 N/sq mm to 400 N/sq mm. The strengthening of these steels relies primarily on the increase in C content, which results in greater amounts of pearlite in the microstructure and thus higher tensile strengths (TS). However, the high C content of these steels greatly reduces notch toughness and weldability. Moreover, the increase of pearlite contents in HR carbon and alloy steels has little effect on YS, which, rather than TS, has increasingly become the main strength criterion in structural design. Nonetheless, C-Mn steels with suitable C contents are used in a variety of applications. If structural plate or shapes with improved toughness are required, small amounts of aluminum (Al) are added for grain refinement. C- Mn steels are also used for stampings, forgings, seamless tubes, and boiler plates. High strength structural C steels have YSs greater than 275 N/sq mm and are available in different product forms such as cold rolled (CR) structural sheet, HR C-Mn steels in the form of sheet, plate, bar, and structural shapes, and heat treated (normalized or quenched and tempered) C steels in the form of plate, bar, and sometimes, sheet and structural shapes. Most common are the heat treated C structural steels, which typically attain yield strengths of 290 N/sq mm to 690 N/sq mm. CR carbon steel sheet are usually with YSs greater than 275 N/sq mm. High strength C- Mn steels are normally used in hot rolled condition. The heat treatment of C steels consists of either normalizing or quenching and tempering. These heat treatments can be used to improve the mechanical properties of structural plate, bar, and occasionally, structural shapes. Structural shapes (such as I and H beams, channels, and special sections) are primarily used in HR condition since warpage is difficult to prevent during heat treatment. Nevertheless, some normalized or quenched and tempered structural sections can be produced in a limited number of section sizes. Normalizing involves air cooling from austenitizing temperatures and produces essentially the same ferrite-pearlite microstructure as that of HR carbon steel, except that the heat treatment produces a finer grain size. This grain refinement makes the steel stronger, tougher, and more uniform throughout. Quenching and tempering (heating to around 900 deg C, water quenching, and tempering at temperatures of 480 deg C to 600 deg C or higher) can provide a tempered martensitic or bainitic microstructure which gives better combinations of strength and toughness. An increase in the C content to around 0.5 %, usually accompanied by an increase in Mn, allows the steels to be used in the quenched and tempered condition. For quenched and tempered C-Mn steels with C contents up to around 0.25 %, low hardenability restricts the section sizes to around 150 mm. The YS of quenched and tempered C-Mn steel plate varies from 315 N/sq mm to 550 N/sq mm, depending on section thickness. Minimum Charpy V-notch impact toughness can be as high as 27 to 34 J (Joules) at temperatures as low as -68 deg C for quenched and tempered C steel having YSs of 345 N/sq mm. However, for quenched and tempered C steel with 690 N/sq mm YSs, the impact values are lower, normally around 20 J at 60 deg C. All steel grades can be grain refined with Al to improve toughness. In addition to high strength plate applications, quenched and tempered C-Mn steels are used for shafts and couplings. Steels with 0.40 % to 0.60 % C are used for railway wheels, tires, and axles, while those with higher C contents can be used as high strength wire laminated spring materials, often with Si (silicon) – Mn or chromium (Cr) vanadium (V) additions. The higher C steels are also used for rails (0.7 % C) and, over a range of C contents for reinforcement bars. Alloy steels are defined as those steels (i) which contain Mn, Si, or Cu (copper) in quantities more than the maximum limits (1.65 % Mn, 0.60 % Si, and 0.60 % Cu) of C steel, or (ii) which have specified ranges or minimums for one or more other alloying additions. The low alloy steels are those steels containing alloying elements, including C, up to a total alloy content of around 8.0 %. Except for plain C steels that are micro-alloyed with V, niobium (Nb), and/or titanium (Ti), most low alloy steels are suitable as engineering quenched and tempered steels and are generally heat treated for engineering use. Low alloy steels with suitable alloy compositions have greater hardenability than structural C steel and, thus, can provide high strength and good toughness in thicker sections by heat treatment. Their alloy contents can also provide improved heat and corrosion resistance. However, as the alloy contents increase, alloy steels become more expensive and more difficult to weld. Quenched and tempered structural steels are primarily available in the form of plate or bar products. Quenched and tempered steels have C contents in the range of 0.10 % to 0.45 %, with alloy contents, either singly or in combination, of up to 1.5 % Mn, 5 % Ni (nickel), 3 % Cr, 1 % Mo (molybdenum), 0.5 % V, and 0.10 % Nb. In some cases these steels contain small additions of Ti, Zr (zirconium) and/or B (boron). Generally the higher the alloy content, the greater the hardenability, and the higher the C content, the greater the available strength. The response to heat treatment is the most important function of the alloying elements in these steels. The hardenability of steel is the property which determines the depth and distribution of martensite induced by quenching. It is usually the single most important criterion for selecting a low alloy steel. To ensure adequate hardenability, the alloys must be in solution in austenite so that they retard the diffusion controlled transformation of austenite to ferrite-pearlite. This allows the slower cooling of a piece or the quenching of a larger piece in a given medium without subsequent transformation of austenite to undesirable ferrite-pearlite transformation products. Hardenability is measured in terms of an ideal diameter (DI), which facilitates the comparison of the hardening response of different steels to the same quenching medium. The ideal diameter, DI, is affected by austenite grain size, C content, and alloy content. An increase in any of these factors reduces or eliminates diffusion controlled transformations, thus encouraging the formation of martensite. C is the most effective alloy for increasing hardenability, but it can be undesirable in structural steels because of its adverse effects on weldability and toughness. Austenite grain size influences not only hardenability but also strength and toughness. Increases in austenite grain size reduce the strength of a given transformation product, but these increases do allow hardening to a greater depth than fine grained steels, all other factors being equal. For steels, in which pearlite (or ferrite) limits the hardenability of the steel, the influence of grain size can be considered independent of the steel composition. For alloy steels in which bainite, rather than pearlite, is the dominant structure limiting full hardening, the effect of austenitic grain size is not the same. Low C (0.06 %) bainite may not be greatly affected by prior austenite grain size. Although a larger grain size improves hardenability, increases in grain size increase the possibility of quench cracking. Larger grain size can also degrade toughness, although avoiding proeutectoid ferrite is the overriding concern in the maintenance of notch toughness. The effect of alloying elements on hardenability was shown by Grossmann in 1942 to be a multiplicative effect rather than an additive effect. During subsequent studies, multiplying factors were developed with the realization that at times interaction effects occurred (that is, the multiplying factor for a given % of an element was not the same when added in conjunction with another element as it was when the element was used alone). As an example, the multiplying factor for Mo varies with Ni content. Also, there is a different set of multiplying factors for low C alloy steels than for medium C alloy steels. In general, alloying elements can be separated according to whether they are austenite stabilizers, such as Mn, Ni, and Cu, or ferrite stabilizers (for example, gamma loop formers), such as Mo, Si, Ti, V, Zr, Nb, W (tungsten). Ferrite stabilizers require a much lower alloying addition than the austenite stabilizers for an equivalent increase in hardenability. However, with many of these ferrite stabilizers the competing process of carbide precipitation in the austenite depletes the austenite of both C and alloy addition, thus lowering hardenability. The precipitates also produce grain refinement, which further decreases hardenability. Effects of alloying elements on the hardenability are given in Tab 1. Mn contributes markedly to hardenability, especially in amounts greater than 0.8 %. The effect of Mn up to 1.0 % is stronger in low C and high C steels than in medium C steels. Mn increases the hardness of tempered martensite by retarding the coalescence of carbides, which prevent grain growth in the ferrite matrix. These effects cause a substantial increase in the hardness of tempered martensite as the percentage of Mn in the steel increases. Ni is similar to Mn at low alloy additions, but is less potent at the high alloy levels. Ni is also affected by C content, the medium C steels having the greatest effect. There is an alloy interaction between Mn and Ni that must be taken into account at lower austenitizing temperatures. Ni has a relatively small effect on the hardness of tempered martensite, which is essentially the same at all the tempering temperatures. Because Ni is not a carbide former, its influence is considered to be due to a weak solid solution strengthening. Cu is usually added to alloy steels for its contribution to atmospheric-corrosion resistance and at higher levels for precipitation hardening. The effect of Cu on hardenability is similar to that of Ni, and in hardenability calculations it has been suggested that the sum of Cu plus Ni be used with the appropriate multiplying factor of Ni. Cu is precipitated out when steel is heated to about 425 deg C – 650 deg C and thus can provide a degree of precipitation hardening. Si is more effective than Mn at low alloy levels and has a strengthening effect on low alloy steels. However, at levels more than 1 % this element is much less effective than Mn. The effect of Si also varies considerably with C content and other alloys present. Si is relatively ineffective in low C steel but is very effective in high C steels. Si increases the hardness of tempered martensite at all tempering temperatures. Si also has a substantial retarding effect on softening at 316 deg C, and has been attributed to the inhibiting effect of Si on the conversion of C (carbide to cementite). Mo is most effective in improving hardenability. Mo has a much greater effect in high C steels than in medium C steels. The presence of Cr decreases the multiplying factor, whereas the presence of Ni enhances the hardenability effect of Mo. Mo retards the softening of martensite at all tempering temperatures. Above 540 deg C, Mo partitions to the carbide phase and thus keeps the carbide particles small and numerous. In addition, Mo reduces susceptibility to tempering embrittlement. Cr behaves much like Mo and has its greatest effect in medium C steels. In low C steel and carburized steel, the effect is less than in medium C steels, but is still significant. As a result of the stability of Cr carbide at lower austenitizing temperatures, Cr becomes less effective. Cr, like Mo, is a strong carbide forming element that can be expected to retard the softening of martensite at all temperatures. Also, by substituting Cr for some of the iron in cementite, the coalescence of carbides is retarded. V is generally not added for hardenability in quenched and tempered structural steels, but is added to provide secondary hardening during tempering. V is a strong carbide former, and the steel must be austenitized at a sufficiently high temperature and for a sufficient length of time to ensure that the V is in solution and thus able to contribute to hardenability. Moreover, solution is possible only if small amount of V is added. V is a stronger carbide former than Mo and Cr and can therefore be expected to have a much more strong effect at equivalent alloy levels. The strong effect of V is probably due to the formation of an alloy carbide that replaces cementite type carbides at high tempering temperatures and persists as a fine dispersion up to the A1 temperature. Tungsten (W) has been found to be more effective in high C steels than in steels of low C content (less than 0.5 %). Alloy interaction is important in W containing steels, with Mn- Mo-Cr having a greater effect on the multiplying factors than Si or Ni additions. W is also a carbide former and behaves like Mo in simple steels. W has been proposed as a substitute for Mo in reduced activation ferritic steels for nuclear applications. Ti, Nb, and Zr are all strong carbide formers and are usually not added to enhance hardenability for the same reasons given for V. In addition, Ti and Zr are strong nitride formers, a characteristic that affects their solubility in austenite and hence their contribution to hardenability. Ti, Nb, and Zr behave like V because they are strong carbide formers. B can considerably improve hardenability, the effect varying notably with the C content of the steel. The full effect of B on hardenability is obtained only in fully deoxidized (aluminum (Al) killed) steels. B has no effect on the tempering characteristics of martensite, but a detrimental effect on toughness can result from the transformation to non-martensitic products. Since the hard martensite produced after quenching is also extremely brittle, practically all hardened steels undergo a subcritical heat treatment referred to as tempering. Tempering improves the toughness of the as quenched martensite, but also softens the steel, thus causing a decrease in strength and an increase in ductility. This softening is largely due to the rapid coarsening of cementite (Fe3C) with increasing tempering temperature and a reduction in dislocation density. Alloying elements help retard the degree of softening during tempering, and certain elements are more effective than others. The alloying elements which act as solid solution strengtheners (Ni, Si, Al, and Mn) remain dissolved in the martensite and do not significantly retard the softening effect, though Si does retard softening by inhibiting the coarsening of Fe3C. The most effective elements in retarding the rate of softening during tempering are the strong carbide forming elements such as Mo, Cr, V, Nb, and Ti. The metal carbides produced from these elements are harder than martensite and have a fine dispersion since the diffusion of the carbide forming elements is more sluggish than the diffusion of C. The lower diffusion rate of the carbide forming elements inhibits the coarsening of Fe3C and thus retards the rate of softening at higher temperatures. The formation of carbides, which is a diffusion controlled process and dependent upon the migration of the carbide forming elements, reduce the rate of softening at all tempering temperatures. The degree of softening also depends on the quantity of the carbide forming element. If the carbide forming elements are present in sufficient quantity, the metal carbides not only reduce softening but also produce a hardness increase at the higher tempering temperature. This hardness increase is frequently referred to as secondary hardening. Given a sufficient level of carbide forming elements, secondary hardening depends on a high enough temperature to allow a sufficient diffusion rate of the carbide-forming elements. Moreover, because the diffusion of the carbide formers is a more sluggish process than C diffusion, the metal carbides formed have a fine dispersion and are very resistant to coarsening. The second characteristic of the fine metal carbides provides good creep resistance and is used to advantage in steels that are not to soften during the higher temperature exposure. Although fittings with 0.6 % Mn and induction bends use quenching and tempering as a standard practice, mild steels (plain, low C steels with less than 0.7 % Mn) with micro-alloying additions of V, Nb, or Ti are rarely used as quenched and tempered steels. However, elements such as B and V are considered as substitutes for other elements that improve hardenability. In terms of hardenability, the basic difficulty with V (and other strong carbide formers such as Ti, Nb, Zr) is that the hardenability of steel can be increased only if small amounts are added and if the steel is austenitized at a high enough temperature and for a long enough time to ensure that the V (or other strong carbide former) is in solution. Views differ on to the practical maximum amount of V which can be added while still avoiding the nucleating effect of undissolved V carbides, which will reduce hardenability. Complete solubility of V during austenitization may not be the only factor in raising hardenability. The interaction of V with other elements and the stabilization of nitrogen (N2) (with Ti) also influence hardenability. There also exists a synergy between Mo and V such that the hardenability of a steel containing 0.15 % V and 0.10 % Mo is considerably superior to that of steel with 0.3 % Mo. Additions of Ti to this partially substituted steel produces a further marginal increase in hardenability. Nb also produces Nb- Mo synergy in quenched and tempered steels. Nb can be present in amounts up to around 0.04 % without a decrease in the hardenability of C steels. Since small amounts of dissolved N2 promote the formation of VN (which removes V from solution and thus detracts from the effectiveness of V as a hardenability raiser), dissolved N2 must be limited via the presence of Ti or excess Al. By tying up the N2 as TiN or AlN, the V can be in solution and thus increase hardenability. Quenched and tempered alloy steels can offer a combination of high strength and good toughness. In addition, quenched and tempered alloy steel plate is available with ultrahigh strengths and enhanced toughness. Improved toughness and high strength are achieved in the Ni-Cr-Mo alloy steels. These steels use Ni to improve toughness. For applications involving exposure to temperatures from 0 deg C to -195 deg C, the ferritic steels with high Ni contents are typically used. Such applications include storage tanks for liquefied hydrocarbon gases and structures and machinery designed for use in cold regions. These steels utilize the effect of Ni content in reducing the impact transition temperature, thereby improving toughness at low temperatures. These steels remain ductile at the lowest testing temperatures. Ferritic Ni steels are too tough at room temperature for valid fracture toughness. The 5 % Ni steel retains relatively high fracture toughness at -162 deg C, and the 9 % Ni steel retains relatively high fracture toughness at -196 deg C. These temperatures approximate the minimum temperatures at which these steels can be used. HSLA steels are a group of low C steels which utilize small amounts of alloying elements to attain YSs of more than 275 N/sq mm in the as rolled or normalized condition. These steels have better mechanical properties and sometimes better corrosion resistance than as rolled C steels. Moreover, since the higher strength of HSLA steels is obtained at lower C contents, the weldability of many of the HSLA steels is comparable to or better than that of the mild steel. HSLA steels are primarily hot rolled into the usual wrought product forms (sheet, strip, bar, plate, and structural sections) and are normally supplied in the as HR condition. However, the production of HR HSLA products may also involve special hot mill processing that further improves the mechanical properties of some HSLA steels and product forms. These processing methods include the following. The controlled rolling of precipitation-strengthened HSLA steels to obtain fine austenite grains and/or highly deformed austenite grains, which during cooling transform into fine ferrite grains that greatly enhance toughness while improving the YS. The accelerated cooling of, preferably, controlled-rolled HSLA steels to produce fine ferrite grains during the transformation of austenite. These cooling rates cannot be rapid enough to form acicular ferrite, nor can they be slow enough so that high coiling temperatures result and thereby cause the over-aging of precipitates. The quenching or accelerated air or water cooling of low C steels (? 0.08 % C) that possess adequate hardenability to transform into low C bainite (acicular ferrite). This microstructure offers an excellent combination of high YSs, excellent weldability and formability, and high toughness (controlled rolling is necessary for low ductile brittle transition temperatures). The normalizing of V containing HSLA steels to refine grain size, thereby improving the toughness and the YS. The inter-critical annealing of HSLA steels (and also C-Mn steels with low C contents) to obtain a dual-phase (DP) microstructure (martensite islands dispersed in a ferrite matrix). This microstructure shows lower YS but, because of rapid work-hardening capability, provides a better combination of ductility and TS than conventional HSLA steels and improved formability. The usefulness and cost effectiveness of these processing methods are highly dependent on product form and alloying element content. In addition to HR products, HSLA steels are also furnished as CR sheet and forgings. The main advantage of HSLA forgings (like as HR HSLA products) is that YSs in the range of 280 N/sq mm to 490 N/sq mm or perhaps higher can be achieved without heat treatment. Base compositions of these micro-alloyed ferrite-pearlite forgings are typically 0.3 % – 0.50 % C and 1.4 % -1.6 % Mn. Low C bainitic HSLA steel forgings have also been developed. HSLA steels include many standard and proprietary grades designed to provide specific desirable combinations of properties such as strength, toughness, formability, weldability, and atmospheric-corrosion resistance. These steels are not considered alloy steels, even though their desired properties are achieved by the use of small additions of the alloying elements. Instead, HSLA steels are classified as a separate steel category, which is similar to as rolled mild C steel with enhanced mechanical properties obtained by the judicious (small) addition of alloy elements and, perhaps, special processing techniques such as controlled rolling. Although HSLA steels are available in many standard and proprietary grades, HSLA steels can be divided into the following seven categories. Weathering steels, which contain small amounts of alloying elements such as Cu and P for improved atmospheric corrosion resistance and solid-solution strengthening. Micro-alloyed ferrite-pearlite steels, which contain very small (usually, less than 0.10 %) additions of strong carbide or carbo-nitride-forming elements such as Nb, V, and/or Ti for precipitation strengthening, grain refinement, and possibly transformation temperature control. As rolled pearlitic steels, which may include C-Mn steels but which may also have small additions of other alloying elements to enhance strength, toughness, formability, and weldability. Acicular ferrite (low C bainite) steels, which are low C (< 0.08 % C) steels with an excellent combination of high YSs, weldability, formability, and good toughness. DP steels, which have a microstructure of martensite dispersed in a ferritic matrix and provide a good combination of ductility and high TS. Inclusion shape controlled steels, which provide improved ductility and through-thickness toughness by the small additions of Ca (calcium), Zr, or Ti, or perhaps rare-earth elements so that the shape of the sulphide inclusions are changed from elongated stringers to small, dispersed, almost spherical globules. Hydrogen (H2) induced cracking resistant steels with low C, low S, inclusion shape control, and limited Mn segregation, plus Cu contents more than 0.26 %. These seven categories are not necessarily distinct groupings, in that HSLA steel may have features from more than one grouping. For example, all the above types of steels can be inclusion shape controlled. Micro-alloyed ferrite-pearlite steel may also have additional alloying elements for corrosion resistance and solid-solution strengthening. The first HSLA steels developed were the weathering steels. These steels contain Cu and other elements that enhance corrosion resistance, solid-solution strengthening, and some grain refinement of the ferritic microstructure. Cu, P, and Si provide corrosion resistance in addition to solid-solution strengthening. These steels reduce corrosion by forming their own protective oxide surface film. Although these steels initially corrode at the same rate as plain C steel, they soon exhibit a decreasing corrosion rate, and after a few years, continuation of corrosion is practically nonexistent. The protective oxide coating is fine textured, tightly adherent, and a barrier to moisture and oxygen (O2), effectively preventing further corrosion. Plain C steel, on the other hand, forms a coarse-textured flaky oxide that does not prevent moisture or O2 from reaching the underlying non corroded steel base. These steels are not recommended for exposure to highly concentrated industrial fumes or severe marine conditions, nor are they recommended for applications in which they are buried or submerged. In these environments, the highly protective oxide does not form properly, and corrosion is similar to that for plain C steel. The various grades of HSLA weathering steels can be classified into two groups namely (I) weathering steels with normal low P contents and multiple alloy additions for solid-solution strengthening and enhanced corrosion resistance, and (ii) proprietary weathering steels with high P contents (0.05 % to 0.15 %) for strengthening and corrosion resistance, together with multiple-alloy additions similar to those of the low P weathering steels. The atmospheric-corrosion resistance of the low P weathering steels is 2 to 6 times that of C structural steel, while the proprietary weathering steels may have higher corrosion resistance. Micro-alloying with V and/or Nb can improve the YS of weathering steels. The addition of Nb also improves toughness. Normalizing or controlled rolling-cooling can also refine the grain size (and thus improve toughness and YS. However, if normalizing or accelerated cooling is used to refine grain size, the effect of C content and alloy additions on hardenability and the potential for undesirable transformations to upper bainite and Widmanstätten ferrite are to be considered. Micro- alloyed ferrite-pearlite steels use additions of alloying elements such as Nb and V to increase strength of HR steels without increasing C and/or Mn contents. Extensive studies during the 1960s on the effects of Nb and V on the properties of structural-grade materials resulted in the discovery that very small amounts of Nb and V (< 0.10 % each) strengthen the standard C-Mn steels without interfering with subsequent processing. C content thus can be reduced to improve both weldability and toughness because the strengthening effects of Nb and V compensated for the reduction in strength due to the reduction in C content. The mechanical properties of micro-alloyed HSLA steels result, however, from more than just the mere presence of micro-alloying elements. Austenite conditioning, which depends on the complex effects of alloy design and rolling techniques, is also an important factor in the grain refinement of HR HSLA steels. Grain refinement by austenite conditioning with controlled rolling methods has resulted in improved toughness and high YSs. This development of controlled rolling processes coupled with alloy design has produced increasing YS levels accompanied by a gradual lowering of the C content. Many of the proprietary micro-alloyed HSLA steels have C contents as low as 0.06 % or even lower, yet are still able to develop high YSs. The high YS is achieved by the combined effects of fine grain size developed during controlled hot rolling and precipitation strengthening that is due to the presence of V, Nb, and Ti. The various types of micro-alloyed ferrite-pearlite steels include (i) V micro-alloyed steels, (ii) Nb micro-alloyed steels, (iii) Nb-Mo steels, (iv) V-Nb micro-alloyed steels, (v) V-N2 micro-alloyed steels, (vi) Ti micro-alloyed steels, (vi) Nb-Ti micro-alloyed steels, and (vii) V-Ti micro-alloyed steels. These steels may also include other elements for improved corrosion resistance and solid-solution strengthening, or improved hardenability (if transformation products other than ferrite-pearlite are desired). 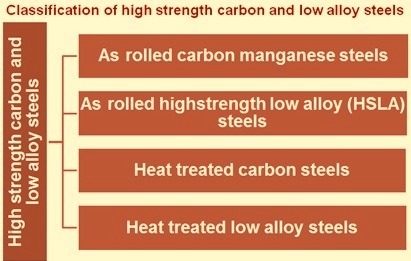 Some specifications of micro-alloyed HSLA steels do not specify the range of micro-alloying additions needed to achieve the desired strength level. These steels are often specified in terms of mechanical properties, with the amounts of micro-alloying elements left to the discretion of the steel producer. The development of V containing steels occurred shortly after the development of weathering steels, and flat rolled products with up to 0.10 % V are widely used in the HR condition. V containing steels are also used in the controlled-rolled, normalized, or quenched and tempered condition. V contributes to strengthening by forming fine precipitate particles (5 nm to 100 nm in diameter) of V(CN) in ferrite during cooling after hot rolling. These V precipitates, which are not as stable as Nb precipitates, are in solution at all normal rolling temperatures and thus are very dependent on the cooling rate for their formation. Nb precipitates, however, are stable at higher temperatures, which is beneficial for achieving fine-grain ferrite. The strengthening from V averages between 5 N/sq mm and 15 N/sq mm per 0.01 % V, depending on C content and rate of cooling from hot rolling (and thus section thickness). The cooling rate, which is determined by the hot rolling temperature and the section thickness, affects the level of precipitation strengthening in a 0.15 % V steel. An optimum level of precipitation strengthening occurs at a cooling rate of about 170 deg C/min. At cooling rates lower than 170 deg C/min, the V(CN) precipitates coarsen and are less effective for strengthening. At higher cooling rates, more V(CN) remains in solution, and thus a smaller fraction of V(CN) particles precipitate and strengthening is reduced. For a given section thickness and cooling medium, cooling rates can be increased or decreased by increasing or decreasing, respectively, the temperature before cooling. Increasing the temperature results in larger austenite grain sizes, while decreasing the temperature makes rolling more difficult. Mn content and ferrite grain size also affect the strengthening of V micro-alloyed steels. The increase in Mn content increases the strength of the matrix because of solid-solution strengthening. The precipitation strengthening by V is also improved since Mn lowered the austenite-to-ferrite transformation temperature, thereby resulting in a finer precipitate dispersion. This effect of Mn on precipitation strengthening is greater than its effect in Nb steels. However, the absolute strength in Nb steel with 1.2 % Mn is only about 50 N/sq mm less than that of V steel but at a much lower alloying element level (that is, 0.06 % Nb versus 0.14 % V). Another factor affecting the strength of V steels is the ferrite grain size produced after cooling from the austenitizing temperature. Finer ferrite grain sizes (which result in not only higher YSs but also improved toughness and ductility) can be produced by either lower austenite-to-ferrite transformation temperatures or by the formation of finer austenite grain sizes prior to transformation. Lowering the transformation temperature, which affects the level of precipitation strengthening as mentioned above, can be achieved by alloying elements additions and/or increased cooling rates. For a given cooling rate, further refinement of ferrite grain size is achieved by the refinement of the austenite grain size during rolling. The austenite grain size of HR steels is determined by the recrystallization and grain growth of austenite during rolling. Vanadium HR steels usually undergo conventional rolling but are also produced by recrystallization controlled rolling. With conventional rolling, V steels provide moderate precipitation strengthening and relatively little strengthening from grain refinement. The maximum YS of conventionally HR vanadium steels with 0.25 % C and 0.08 % V is around 450 N/sq mm. The practical limit of YSs for HR vanadium micro-alloyed steel is around 415 N/sq mm, even when controlled rolling techniques are used. V steels subjected to recrystallization controlled rolling require a Ti addition so that a fine precipitate of TiN is formed that restricts austenite grain growth after recrystallization. YSs from conventional controlled rolling are limited to a practical limit of around 415 N/sq mm because of the lack of retardation of recrystallization. When both strength and impact toughness are important factors, controlled rolled low C-Nb steel is preferable. Like V, Nb increases YS by precipitation hardening. The magnitude of the increase depends on the size and amount of precipitated Nb carbides. However, Nb is also a more effective grain refiner than V. Thus, the combined effect of precipitation strengthening and ferrite grain refinement makes Nb a more effective strengthening agent than V. The usual Nb addition is 0.02 % to 0.04 %, which is around one-third the optimum V addition. Strengthening by Nb is 35 N/sq mm to 40 N/sq mm per 0.01 % addition. This strengthening is associated with a considerable deterioration in the notch toughness and hence special rolling procedures and lower C contents are needed to avoid formation of upper bainite. Overall, high finishing temperatures and light deformation passes are to be avoided with Nb steels since it can result in mixed grain sizes or Widmanstätten ferrite, which impair toughness. Nb steels are produced by controlled rolling, recrystallization controlled rolling, accelerating cooling, and direct quenching. The recrystallization controlled rolling of Nb steel can be effective without Ti, while recrystallization rolling of V steels needs Ti for grain refinement. Also, much less Nb is needed, and Nb-Ti steels can be recrystallization controlled rolled at higher temperatures. Steels micro-alloyed with both Nb and V provide a higher YS in the conventionally HR condition than that achievable with either element alone. As conventionally hot rolled, the Nb-V steels derive almost all of their increased strength from precipitation strengthening and hence have high ductile-brittle transition temperatures. If the steel is controlled rolled, the addition of both Nb and V together is especially advantageous for increasing the YS and lowering ductile-brittle transition temperatures by grain refinement. Normally Nb- V steels are made with relatively low C contents (< 0.10 % C). This reduces the amount of pearlite and improves toughness, ductility, and weldability. These steels are frequently referred to as pearlite-reduced steels. Nb-Mo micro-alloyed steels have either a ferrite-pearlite microstructure or an acicular ferrite microstructure. In ferrite-pearlite Nb steels, the addition of Mo increases the YS and TS by about 20 N/sq mm and 30 N/sq mm, respectively, per 0.1 % Mo. over a range of 0 % to 0.27 % Mo. The principal effect of Mo on the microstructure is to alter the morphology of the pearlite and to introduce upper bainite as a partial replacement for pearlite. However, since the individual strength values of pearlite and bainite are somewhat similar, it is seen that the strength increase is due to solid-solution strengthening and improved Nb(CN) precipitation strengthening caused by a Mo-Nb synergy. The interaction between Mo and Nb (or V) is been seen as a reason for the increase in precipitation strengthening by the addition of Mo. This effect has is due to the reduced precipitation in austenite from an increase in solubility arising from a decrease in C activity brought about by Mo. With less precipitation in austenite, more precipitates are formed in the ferrite, resulting in enhanced strength. Also, Mo has been identified in the precipitates. Its presence increases precipitates’ strengthening effectiveness by increasing coherency strains and/or by increasing the volume fraction of precipitation. V combines more strongly with N2 than does Nb and forms VN precipitates in V-N2 steel. N2 additions to high strength steels containing V are commercially important since the additions improve precipitation hardening. Precipitation hardening is accompanied by a drop in notch toughness, but this can often be overcome by lowering the C content. The precipitation of VN also causes grain refinement. However, delayed cracking is a major problem in these steels. The use of N2 is not recommended for steels that ate to be welded because of its detrimental effect on notch toughness in the heat affected zone. Ti in low C steels forms a number of compounds which provide grain refinement, precipitation strengthening, and sulphide shape control. However, since Ti is also a strong deoxidizer, Ti can be used only in fully killed (Al deoxidized) steels so that Ti is available for forming into compounds other than titanium oxide. Like Nb and/or V steels, Ti micro-alloyed steels are strengthened by mechanisms which involve a combination of grain refinement and precipitation strengthening. The combination depends on the amount of alloy additions and processing methods. In reheated or continuously cast steels, small amounts of Ti (? 0.025 %) are effective grain refiners since austenite grain growth is retarded by Ti nitride (TiN). Small amounts of Ti are also effective in recrystallization controlled rolling since TiN retards the grain growth of recrystallized austenite. In conventional controlled rolling, however, Ti is a moderate grain refiner, causing less refinement than Nb but more than V.
In terms of precipitation strengthening, a sufficient amount of Ti is required to form Ti carbide (TiC). Small percentages of Ti (<0.025 %) form mainly into TiN, which has an effect on austenite grain growth but little effect on precipitation strengthening because the precipitates formed in the liquid are too coarse. Increasing the Ti content leads to the formation first of Ti containing Mn sulphide inclusions (Mn, Ti)S, and then of globular carbo-sulphides, Ti4C2S2 (which provide sulphide shape control). The formation of Ti4C2S2 is accompanied by and followed by TiC formation, which can be used for the precipitation strengthening of low C steels. To determine the amount of Ti that is available for precipitation strengthening, the total Ti content is to be adjusted for the formation of the coarse, insoluble TiN and Ti4C2S2 which do not participate in precipitation strengthening. Usually strength increases from TiC precipitation have ranged up to 440 N/sq mm for very fine particles (less than 30 A?) and a relatively large fraction of precipitate. If sufficient amounts of Ti are used, TiC can provide more precipitation strengthening than either Nb or V. However, since higher levels of precipitation strengthening are normally associated with reduced toughness, grain refinement is necessary to improve toughness. Ti is a moderate grain refiner (compared to Nb and V in HR steels), and the high levels of precipitation strengthening of Ti micro-alloyed steels result in a severe disadvantage in toughness. Using only Ti as a strengthener in high-strength HR strip also results in undesirable variability in mechanical properties. Although precipitation-strengthened Ti steels have limitations in terms of toughness and variability of mechanical properties, it is seen that an addition of Ti to low C Nb steels results in an overall improvement in properties. Ti increases the efficiency of Nb since it combines with the N2 forming TiN, thus preventing the formation of Nb nitride (NbN). This allows for increased solubility of Nb in the austenite resulting in subsequent increased precipitation of Nb(C,N) particles in the ferrite. The addition of 0.04 % Ti to steel strip containing various amounts of Nb consistently produces a YS increase of around 105 N/sq mm for a coiling temperature of 675 deg C. HR Nb-Ti steel strip is effective in achieving YSs of 550 N/sq mm in ferrite-pearlite steels. Addition of either V or Mo can raise YSs to 690 N/sq mm. As rolled pearlitic structural steels are a specific group of steels in which enhanced mechanical properties (and, in some cases, resistance to atmospheric corrosion) are obtained by the addition of moderate amounts of one or more alloying elements other than C. Some of these steels are C-Mn steels and differ from ordinary C steels only in having a greater Mn content. Other pearlitic structural steels contain small amounts of alloying elements, which are added to enhance weldability, formability, toughness, and strength. The as rolled pearlitic structural steels are characterized by as rolled YSs in the range of 290 N/sq mm to 345 N/sq mm. They are not intended for quenching and tempering and are not to be subjected to such treatment. For certain applications, they may be annealed, normalized, or stress relieved, processes which may alter mechanical properties. When these steels are used in welded structures, care is to be taken in grade selection and in the specification of the welding process details. Certain grades can be welded without preheating or post heating. The basic disadvantages of these steels are that the pearlitic microstructure raises the ductile-brittle transition temperature but does not improve YSs. In addition, the high C content (relative to other HSLA steels) reduces weldability. Another approach to the development of HSLA steels is to obtain a very fine, high strength acicular ferrite microstructure, instead of the usual polygonal ferrite microstructure, during the cooling transformation of ultralow C (< 0.08 % C) steels with sufficient hardenability (by additions of Mn, Mo, and/or B). Nb can also be used for precipitation strengthening and grain refinement. The principal difference between the structure of acicular ferrite (which is also referred to as low C bainite) and that of polygonal ferrite is that the former is characterized by a high dislocation density and fine, highly elongated grains which are not shown in polygonal ferrite. Acicular ferrite steels can be obtained by quenching or, preferably, by air cooling with suitable alloying elements for hardenability. The principal advantage of this type of HSLA steel is the unusual combination of high YSs, high toughness, and good weldability. The major application of acicular ferrite steel is in oil pipelines in arctic conditions. This application needs a combination of high strength, superior toughness, excellent resistance to H2 induced cracking, and good field weldability. Tough acicular ferrite steel for line pipe is produced through the optimization of C and Nb content, the addition of B, and/or the application of on line accelerated cooling. In this application, optimum C content ranges from 0.01 % to 0.05 %. Below 0.01 % C, grain boundaries in the heat affected zone (HAZ) are embrittled, resulting in inter-granular, H2 induced cracking and loss of toughness in the HAZ. The addition of B and/or the application of on-line accelerated cooling ensure both high strength and superior toughness, along with desirable welding properties. DP steels have a microstructure with 80 % to 90 % polygonal ferrite and 10 % to 20 % martensite islands dispersed throughout the ferrite matrix. These steels have a low YS and continuous yielding behaviour. Hence, they form just like low strength steel, but they can also provide high strength in the finished component because of their rapid work hardening rate. DP steels are produced from low C steels in three ways namely (i) Inter-critical austenitization of C-Mn steels followed by rapid cooling, (ii) hot rolling with ferrite formers such as Si and transformation delaying elements such as Cr, Mn, and/or Mo, and (iii) continuous annealing of CR C-Mn steel followed by quenching and tempering. Steels with very low interstitial contents show excellent formability with low YS, high elongation, and good deep drawability. With the addition of carbo-nitride forming elements, the deep drawability and the non-aging properties are further improved. The effect of Nb, unlike that of other micro-alloyed elements, is to improve the planar anisotropy, reducing earing. This is due to the finer grain size already in the hot strip material prior to cold rolling. Ti is also added to improve the effectiveness of Nb. An important development in micro-alloyed HSLA steels is the use of inclusion shape control. Sulphide inclusions, which are plastic at rolling temperatures and thus elongate and flatten during rolling, adversely affect ductility in the short transverse (through thickness) direction. The main objective of inclusion shape control is to produce sulphide inclusions with negligible plasticity at even the highest rolling temperatures. The preferred method for sulphide shape control involves Ca-Si ladle additions. However, sulphide shape control is also performed with small additions of rare-earth elements, Zr, or Ti which change the shape of the sulphide inclusions from elongated stringers to small, dispersed, almost spherical globules. This change in the shape of sulphide inclusions substantially increases transverse impact energy and improves formability. Inclusion shape control with rare-earth elements is being seldom used because rare-earth elements produce relatively dirty steel. Sulphide inclusion shape control performs several important roles in HSLA steels. It improves transverse impact energy and minimizes lamellar tearing in welded structures by improving through-thickness properties that are critical in constrained weldments. Most HSLA steels are furnished in the as HR condition with ferritic-pearlitic microstructure. The exceptions are the controlled rolled steels with an acicular ferrite microstructure and the DP steels with martensite dispersed in a matrix of polygonal ferrite. These two types of HSLA steels use the formation of eutectoid structures for strengthening, while the ferritic-pearlitic HSLA steels normally require strengthening of the ferrite. Pearlite is usually an undesirable strengthening agent in structural steels since it reduces impact toughness and requires higher C contents. Moreover, YS is largely unaffected by a higher pearlite content. The ferrite in HSLA steels is typically strengthened by grain refinement, precipitation hardening, and, to a lesser extent, solid-solution strengthening. Grain refinement is the most desirable strengthening mechanism because it improves not only strength but also toughness. Grain refinement is influenced by the complex effects of alloy design and processing methods. For example, the various methods of grain refinement used in the three different stages of hot rolling (that is, reheating, hot rolling, and cooling) include (i) the addition of Ti or Al to retard austenite grain growth when the steel is reheated for hot deformation or subsequent heat treatment, (ii) the controlled rolling of micro-alloyed steels to condition the austenite so that it transforms into fine grain ferrite, and (iii) the use of alloy additions and/or faster cooling rates to lower the austenite-to-ferrite transformation temperature. The use of higher cooling rates for grain refinement needs consideration of its effect on precipitation strengthening and the possibility of undesirable transformation products. Precipitation strengthening occurs from the formation of finely dispersed carbo-nitrides developed during heating and cooling. Since precipitation strengthening is usually associated with a reduction in toughness, grain refinement is frequently being used in conjunction with precipitation strengthening to improve toughness. Precipitation strengthening is influenced by the type of carbo-nitride, its grain size, and, of course, the number of carbo-nitrides precipitated. The formation of MC is the most effective metal carbide in the precipitation strengthening of micro-alloyed niobium, vanadium, and/or titanium steels. The number of fine MC particles formed during heating and cooling depends on the solubility of the carbides in austenite and on cooling rates. Accurate steelmaking operations are also essential in controlling the properties and chemistry of HSLA steels. Optimum property levels depend on such factors as the control of significant alloying elements and the reduction of impurities and nonmetallic inclusions. Developments in secondary steelmaking such as desulphurization, vacuum degassing, and argon shrouding have enabled better control of steel chemistry and the effective use of micro-alloyed elements. In particular, the use of vacuum degassing equipment allows the production of IF steels. The IF steels show good formability, high elongation, and good deep drawability. The principal function of alloying elements in these ferrite-pearlite HSLA steels, other than corrosion resistance, is strengthening of the ferrite by grain refinement, precipitation strengthening, and solid solution strengthening. Solid solution strengthening is closely related to the content of alloying elements, while grain refinement and precipitation strengthening depend on the complex effects of alloy design and thermo-mechanical treatment. Alloying elements are also selected to influence transformation temperatures so that the transformation of austenite to ferrite and pearlite occurs at a lower temperature during air cooling. This lowering of the transformation temperature produces a finer grain transformation product, which is a major source of strengthening. At the low C levels typical of HSLA steels, elements such as Si, Cu, Ni, and P are particularly effective for producing fine pearlite. Elements such as Mn and Cr, which are present in both the cementite and ferrite, also strengthen the ferrite by solid-solution strengthening in proportion to the amount dissolved in the ferrite. Carbon markedly increases the amount of pearlite in the microstructure and is one of the more effective, as well as economical, strengthening elements. However, higher C contents reduce weldability and the impact toughness of steel. Increases in pearlite content are also ineffective in improving Ys, which is frequently the main strength criterion in structural applications. In the presence of alloying elements, the practical maximum C content at which HSLA steels are used in the as rolled condition is around 0.20 %. Higher levels of C tend to form martensite or bainite in the microstructure of as rolled steels, although some of the higher strength low alloy steels have C contents that approach 0.30 %. Many of the proprietary micro-alloyed HSLA steels have C contents of 0.06 % or lesser, yet are still able to develop YSs of 345 N/sq mm to 620 N/sq mm. C levels as low as 0.03 % is utilized in some alloy designs. The required strength is developed by the combined effect of (i) fine grain size developed during controlled hot rolling and enhanced by micro-alloyed elements (especially Nb), and (ii) precipitation strengthening caused by the presence of V, Nb, and Ti in the composition. Nitrogen in amounts up to around 0.02 % has been used to obtain strengths typical of HSLA steels and at reasonable cost. For C and C-Mn steels, such a practice is limited to light gauge products because the increase in strength is accompanied by a drop in notch toughness. In some uses, N2 contents are limited to 0.005 %. N2 additions to high strength steels containing V is of commercial importance since such additions enhance precipitation hardening. The precipitation of V nitride (VN) in V-N2 steels also improves grain refinement since it has a lower solubility in austenite than V carbide (VC). Manganese is the principal strengthening element in plain C high strength structural steels when it is present in amounts above 1 %. It functions mainly as a mild solid-solution strengthener in ferrite, but it also provides a marked decrease in the austenite-to-ferrite transformation temperature. In addition, Mn enhances the precipitation strengthening of V steels and, to a lesser extent, Nb steels. Silicon is used as a deoxidizer in liquid steel which is one of the most important applications of it. It is generally present in fully deoxidized structural steels in amounts up to 0.35 %. Si has a strengthening effect in low alloy structural steels. In larger amounts, it increases resistance to scaling at higher temperatures. Si has a significant effect on YS improvement by solid solution strengthening and is widely used in HSLA steels for riveted or bolted structures. It is used up to 0.30 % in weldable steels. Higher amounts produce deterioration in notch toughness and weldability. Copper in amounts around 0.20 % is used to provide resistance to atmospheric corrosion. Its effect on resistance to corrosion is enhanced when P is present in amounts greater than around 0.05 %. Cu in excess of 0.50 % also increases the strength of both low C and medium C steels by virtue of ferrite strengthening, which is accompanied by only slight decreases in ductility. In amounts above around 0.60 %, Cu can precipitate as –copper and this precipitation strengthen the ferrite. Cu is usually retained in solid solution even at the slow rate of cooling obtained when large sections are normalized, but it is precipitated out when the steel is reheated to around 510 deg C to 605 deg C. At around 1 % Cu, the YS is increased by about 70 N/sq mm to 140 N/sq mm, regardless of the effects of other alloying elements. Cu in amounts up to 0.75 % is considered to have only minor adverse effects on notch toughness or weldability. Cu precipitation hardening gives the steel the ability to be formed extensively (while still low in strength) and then precipitation hardened as a complex shape or welded assembly. This avoids the distortion or difficulty encountered by quenching compared with components made from conventionally heat-treated alloy steels. Steels containing more than 0.50 % Cu show hot shortness, with the result that cracks and a rough surface develop during hot working. Careful control of oxidation during heating and prevention of overheating minimize these conditions. The addition of Ni in amounts equal to at least one-half the copper content is very beneficial to the surface quality of Cu bearing steels. Cu is also added in amounts around 0.25 % – 0.35 % to improve resistance to H2 induced cracking in aqueous environments and H2S environments. Phosphorus is an effective solid-solution strengthener in ferrite. It also enhances corrosion resistance but causes a decrease in ductility. P at low levels (< 0.05 %) can also cause embrittlement through segregation to the prior-austenite grain boundaries. The atmospheric-corrosion resistance of steel is increased appreciably by the addition of P, and when small amounts of Cu are present in the steel, the effect of the P is greatly enhanced. When both P and Cu are present, there is a greater beneficial effect on corrosion resistance than the sum of the effects of the individual elements. Chromium is often added with Cu to obtain improved atmospheric-corrosion resistance. Upon exposure to the atmosphere, a steel composition with around 0.12 % P, 0.85 % Cr, and 0.40 % Cu develops a particularly adherent, dense oxide coating that is characteristic of weathering steels. Nickel is usually added in amounts up to around 1 % in several HSLA steels and in amounts up to 5 % for high-strength heat treated alloy grades. It moderately increases strength by solution hardening of the ferrite. In HSLA steels, it enhances atmospheric-corrosion resistance and, when present in combination with Cu and/or P, increases the seawater corrosion resistance of steels. Ni is frequently added to Cu bearing steels to minimize hot shortness. Molybdenum in hot rolled HSLA steels is used primarily to improve hardenability when transformation products other than ferrite-pearlite are desired. For example, Mo is an essential ingredient for producing as rolled acicular ferrite steels. In addition, it effectively improves higher temperature properties. Mo (0.15 % to 0.30 %) in micro-alloyed steels also increases the solubility of Nb in austenite, thereby improving the precipitation of NbC(N) in the ferrite. This increases the precipitation strengthening effect of Nb(C,N). Mo has also been shown to join the Nb(C,N) precipitates, which further raises the YS. Niobium in small amounts (0.03 % to 0.05 %) increases YS by a combination of precipitation strengthening and grain refinement. Nb is a more effective grain-refining element than V since NbC is more stable in austenite than VC at typical rolling temperatures. The lower solubility of NbC in austenite provides more stable precipitate particles, which pin the austenite grain boundaries and thus retard austenite grain growth. Aluminum is widely used as a deoxidizer and was the first element used to control austenite grain growth during reheating. During controlled rolling, Nb and Ti are more effective grain refiners than Al. Ti, Nb, Zr, and V are also effective grain growth inhibitors during reheating. However, for steels which are heat treated (quenched and tempered), these elements may have adverse effects on hardenability since their carbides are quite stable and difficult to dissolve in austenite prior to quenching. Vanadium strengthens HSLA steels by both the precipitation hardening of the ferrite and refining of the ferrite grain size. The precipitation of V(CN) in ferrite can develop a significant increase in strength that depends not only on the rolling process used, but also on the base composition. C contents above 0.13 % to 0.15 % and Mn content of 1 % or more improves the precipitation hardening, particularly when the N2 content is at least 0.01 %. Grain size refinement depends on thermal processing (hot rolling) variables, as well as V content. Titanium is unique among alloying elements since it provides both precipitation strengthening and sulphide shape control. Small amounts of Ti (< 0.025 %) are also useful in limiting austenite grain growth. However, it is useful only in fully killed (Al deoxidized) steels because of its strong deoxidizing effects. The versatility of Ti is limited because variations in O2, N2, and S affect the contribution of Ti as a carbide strengthener. Zirconium can also be added to killed high strength low alloy steels to improve inclusion characteristics, particularly in the case of sulphide inclusions, for which changes in inclusion shape improve ductility in transverse bending. Boron has no effect on the strength of normal HR steel but can considerably improve hardenability when transformation products such as acicular ferrite are desired in low C HR plate. Its full effect on hardenability is obtained only in fully deoxidized (Al killed) steels. Rare-earth elements, principally cerium (Ce), lanthanum (La), and praseodymium (Pr), can be used to provide shape control of sulphide inclusions. Sulphide inclusions, which are plastic at rolling temperatures and thus elongate and flatten during rolling, adversely affect ductility in the short transverse (through-thickness) direction. The chief role of rare-earth additives is to produce rare-earth sulphide and oxy-sulphide inclusions, which have negligible plasticity at even the highest rolling temperatures. Excessive amounts of cerium (> 0.02 %) and other rare-earth elements lead to oxide or oxy-sulphide stringers that may affect directionality. Treatment with rare-earth elements is seldom done since they produce relatively dirty steels. Treatment with Ca is preferred for sulphide inclusion shape control. Controlled rolling during the hot rolling process is now being increasingly applied to micro-alloyed steels with compositions carefully chosen to provide optimum mechanical properties at room temperature. Controlled rolling is a procedure whereby the various stages of rolling are temperature controlled, with the amount of reduction in each pass predetermined and the finishing temperature precisely defined. This processing is widely used to obtain reliable mechanical properties in steels for pipelines, bridges, offshore platforms, and many other engineering applications. The use of controlled rolling has resulted in improved combinations of strength and toughness and further reductions in the C content of micro-alloyed HSLA steels. This reduction in C content improves not only toughness but also weldability. The basic objective of controlled rolling is to refine and/or deform austenite grains during the rolling process so that fine ferrite grains are produced during cooling. Controlled rolling can be performed on C steels but is most beneficial in steels with V and/or Nb additions. During hot rolling, the undissolved carbo-nitrides of V and Nb pin austenite grain boundaries and thus retard austenite grain growth. In C steels, however, the temperatures involved in hot rolling lead to marked austenite grain growth, which basically limits any benefit of grain refinement by controlled rolling. Controlled rolling is performed on strip, plate, and bar mills but not on continuous hot strip mills. On a hot strip mill, the water cooling on the run-out table ensures a fine grain size. The three methods of controlled rolling are (i) conventional controlled rolling, (ii) recrystallization controlled rolling, and (iii) dynamic recrystallization controlled rolling. These three methods use different techniques for grain refinement, but they are all preceded by a roughing operation to refine grain size by repeated recrystallization. In the roughing stage, stable carbo-nitride precipitates are desirable because they pin the grain boundaries of the recrystallized austenite and thus prevent their growth. Nb is more effective than V in preventing austenite grain growth during rolling since Nb forms precipitates that are less soluble than VC in austenite. Roughing can achieve austenite grain sizes of the order of 20 micrometers. The austenite grains are then either deformed or further refined by controlled rolling during finishing operations. Conventional controlled rolling is based on the deformation or flattening, of austenite grains so that a large number of nucleation sites exist on the deformed austenite grain boundaries and on the deformation bands with the austenite grains. These nucleation sites allow the formation of very fine-grain ferrite during transformation cooling. This process requires a total reduction of up to 80 % in a temperature range where the austenite deforms but does not recrystallize. Nb is the most effective alloying element for grain refinement by conventional controlled rolling. During the rolling reductions at temperatures below 1040 deg C, the Nb in solution suppresses recrystallization by solute drag or by strain-induced Nb(C,N) precipitation on the deformed austenite and slip planes. The strain-induced precipitates are too large to affect precipitation strengthening but are beneficial for two reasons namely (I) they allow additional suppression of recrystallization by preventing migration of austenite grain sub-boundaries, and (ii) they provide a large number of nuclei in the deformed austenite for the formation of fine ferrite particles during cooling. The strain-induced precipitates in the austenite detract from the precipitation-hardening potential of the ferrite by removing the available Nb from austenite solid solution. However, a useful measure of precipitation strengthening is possible in controlled-rolled Nb steels. The controlled rolling of Nb steels leads to ferrite grain sizes in the range of 5 to 10 micrometers. Since the precipitation of Nb(CN) in the austenite during hot rolling retards recrystallization and raises the temperature at which recrystallization of austenite ceases (the recrystallization stop temperature), a wider temperature range is possible for hot working the steel to produce highly deformed austenite. The optimum amount of Nb to suppress recrystallization between passes can be as little as 0.02 %. Ti, Zr, and V are not as effective as Nb in raising the recrystallization stop temperature. Ti and Zr nitrides formed during solidification and upon cooling of the steel do not readily dissolve upon reheating to hot rolling temperatures. Although these nitrides may prevent grain coarsening upon reheating, they are not effective in preventing recrystallization, because insufficient Ti or Zr remains in solution at the rolling temperature to precipitate on deformed austenite during boundaries during hot rolling and thus suppress austenite recrystallization. V, on the other hand, is so soluble that precipitation does not readily occur in the austenite at normal hot rolling temperatures. The concentrations of Nb, Ti, V, C, and N2, the degree of strain, the time between passes, the strain rate, and the temperature of deformation all influence recrystallization during hot working. Recrystallization controlled rolling is used for thicker sections to refine austenite grain size. This process results in ferrite grain sizes of the order of 8 to 10 micrometers. Recrystallization controlled rolling involves the recrystallization of austenite at successively lower temperatures below roughing temperatures but still above 900 deg C. Recrystallization is not to be sluggish for this method to succeed, and thus V can be beneficial because VC is readily dissolved at the rolling temperature and hence unavailable for suppressing recrystallization. However, V steels require stable carbo-nitrides, such as TiN, to retard grain growth after recrystallization. Nb steels, on the other hand, can undergo recrystallization controlled rolling at higher temperatures with Nb(C,N) precipitates eventually forming. This precipitation of Nb(C,N) restricts austenite grain growth and preclude the need for a Ti addition. Dynamic recrystallization controlled rolling is used when there is insufficient time for recrystallization between rolling passes. This process initiates recrystallization during deformation and needs appreciable reductions (say, 100 %) to achieve an austenite grain size of 10 micrometers. With low temperature finishing, dynamic recrystallization results in ferrite grain as fine as 3 to 6 micro meters. Inter-pass cooling in controlled rolling is done for reducing processing time by the application of accelerated cooling both during the delay period and between individual roughing and finishing passes. In general, it appears that the process time can be shortened by 30 % to 40 %, depending on exactly when forced cooling is applied in the rolling schedule. The as rolled microstructure is not affected very much by intermittent cooling between passes but prolonged exposure to water during the hold period causes the temperature of the surface layers of the plate to fall below Ar3. On resumption of rolling, this surface shell is re-austenitized by heat conduction from the interior of the plate; the surface austenite grain size is thus much finer than that in the rest of the material, and this difference persists in the microstructure after rolling. Such non-uniformity of microstructure and properties in the through thickness direction is hardly desirable, but it is unlikely to be directly detrimental to any particular bulk property of the plate (with the possible exception of bendability). Plates processed with shorter rolling times by the application of accelerated cooling between passes and/or under holding appear to show equivalent strength and toughness properties to those controlled rolled in the conventional manner. Normalizing is used to refine the ferrite-pearlite grain size in HSLA steels. However, because micro-alloyed HSLA steels involve some strengthening by precipitation hardening, normalizing causes a reduction in precipitation strengthening when stable carbo-nitride precipitates coarsen at typical austenitizing temperatures for normalizing. As an example, normalizing a conventionally HR Nb steel reduces the YS considerably so that much of the precipitation strengthening increment that is due to Nb in the as-rolled condition is lost. At the usual austenitizing temperatures for normalizing, most of the Nb has not been taken into solution and is present as relatively coarse precipitates. Thus, Nb inhibits grain coarsening, but provides little or no precipitation strengthening when the steel is normalized. However, the grain refining accounts for the improved low temperature impact properties and most of the small increase in strength, compared to a Nb free steel. Normalized Nb steels thus provide a fairly good combination of YS and ductile-brittle impact transition temperatures. Nb steels, along with Ti and V steels, in the form of normalized, heavy-gauge plate find important applications in offshore and general construction, shipbuilding, and pressure vessels. Normalized steels of this type are always fully Al killed. Although normalized Nb steels have a finer ferrite grain size than do normalized C-Mn steels, when strength is of utmost importance, controlled rolling of Nb steels is preferred over normalizing because controlled rolling also provides a measure of precipitation strengthening. V, on the other hand, causes marked precipitation strengthening with limited grain refinement upon normalizing since practically all of the V goes in solution at usual normalizing temperatures. The strengthening with V in normalized steels is far greater than can be obtained in normalized Nb steels. In the normalized condition, V structural steels also have impact properties superior to those of the Nb steels since V combines with part of the N2, thereby reducing the free N2 content. The three major types of HSLA steel microstructures are DP microstructures, acicular ferrite microstructures, and ferrite-pearlite microstructures. HR steels with ferrite-pearlite microstructures are the most common HSLA steels. Commercially available HSLA steels with ferrite-pearlite microstructures have YSs ranging up to 700 N/sq mm, which is almost a fourfold increase over the 200 N/sq mm YS of conventional HR plain C steels. The increased strengths are developed by variations in composition and processing, but compositions having similar strengths are produced in different ways by different producers. The three principal micro-alloying additions are Nb. V and Ti. Other additions can be made, depending on processing capabilities (particularly the cooling facilities) and on property requirements for the finished steel. In order to achieve good transverse properties, Ca-Si ladle additions (or, less often, additions of rare-earth elements) are used in Nb or V containing steels to control the shape of sulphide inclusions. For HSLA compositions containing Ti, ladle treatments for sulphide shape control are not required; Ti itself has the desired effect on the shape of sulphide inclusions. These days, Ca treatment has replaced rare-earth elements in sulfide inclusion shape control. Tensile properties of some HR ferrite-pearlite HSLA steels are influenced by alloying elements and production methods. In V micro-alloyed HSLA steels, YSs are influenced by Mn content, N2 content and cooling rates. The cooling rate, which determines the level of precipitation strengthening in V steels, depends on the temperature, the product thickness, and the cooling medium. For thin products, temperature is the prime factor influencing cooling rates. YSs in Nb steels are also affected by rolling procedures and cooling rates. The notch toughness of micro-alloyed structural steels, as evaluated by Charpy-impact or drop-weight tests, is normally better to that of structural C steels. The transition temperatures of the former also are lower. In the presence of a stress raiser, brittle failure is less likely to occur at subnormal temperatures in steels with lower transition temperatures. The transition temperatures of proprietary grades in the as rolled or normalized conditions are controlled mainly by chemical composition (particularly C) and ferrite grain size. Notch toughness is reduced when the ferrite-pearlite HSLA steels are strengthened by precipitation hardening. The notch toughness of V steels is improved by normalizing or recrystallization controlled rolling. The notch toughness of Nb steels is normally improved by conventional controlled rolling, while the effects of recrystallization controlled rolling are under study. Most structural steels show a transition in fracture behaviour from ductile to brittle when the temperature is lowered to some critical temperature known as the nil-ductility transition temperature (NDTT). This temperature is defined as the temperature at which steel loses its ability to flow plastically in the presence of a sharp, crack like discontinuity. At and below the NDTT, a brittle cleavage fracture initiates from this discontinuity when stresses approaching the YS are reached in the volume of material surrounding the discontinuity. Once initiated, brittle fracture can propagate easily through regions of the structure that is subjected only to low levels of applied stress. In some steels, the transition from ductile to brittle fracture occurs at relatively high temperatures if a mechanical or metallurgical notch is present. If no sharp notch or crack is present, temperatures as low as -75 deg C are necessary for producing the brittle fracture. For welded structures, it is assumed that sharp notches are present and this makes brittle fracture at normal operating temperatures an important concern. Most structural members remain within elastic loadings, except for corners, cutouts, and similar locations where slight yielding can occur. For this type of service, brittle fracture is possible when certain conditions exist such as (i) the temperature is below the characteristic NDTT value for the steel being used, (ii) a crack like notch is present, (iii) load values are sufficiently large to raise the nominal stress level in the area of the notch to values close to or exceeding the YS. At and below the NDTT, the effects of residual stress need to be considered. Weldments can contain residual stresses as high as 80 % of the original YS. In these cases, an applied stress of only 20 % of the YS is sufficient to initiate brittle fracture. All three factors, high stress, low temperature, and crack like flaws, are to be present for brittle fracture to initiate. However, as flaw size increases, the stress required for crack initiation decreases. With larger flaw sizes, the levels can be well below the YS, and residual stresses play an increasingly important role. At temperatures slightly above or below the NDTT, localized plastic deformation is required to initiate brittle fracture, and residual stresses are less harmful. At temperatures well below the NDTT, design is critical and the nominal stress (the sum of applied stress and residual stress) is not to exceed the YS at the locations of crack like flaws. In general, the lower the temperature below NDTT, the less severe the notch is to be for initiating the brittle fracture. For very thin sections, stresses act in a manner which makes brittle fracture considerations less critical. Each type of HSLA steel has a range of NDTT values which depends on chemical composition, as rolled ferritic grain size, and other variables. A range of 35 deg C is not uncommon. In micro-alloyed HSLA steels, the changes in mechanical properties resulting from the use of Nb and V, together with controlled rolling, result in improved YS, weldability, and toughness. The ferrite grain size is reduced, with an attendant increase in YS. Because of this increase, any reduction in toughness due to precipitation strengthening is usually to be tolerated. The remaining properties, however, are typical only of samples tested in the direction of rolling. In the transverse direction, toughness is reduced considerably, and formability is inadequate because of the characteristic shape of nonmetallic inclusions which, during rolling, become elongated in the rolling direction. For Al killed steels the low shelf energy in the transverse direction is caused primarily by elongated sulphide inclusions. Reducing the S content to 0.010 % is not sufficient to eliminate directionality. To prevent the sulphides from becoming excessively elongated during hot rolling, it is necessary to alter their composition. This can be done by adding elements such as Zr, Ti, Ca, or rare earths, which form sulphides having high melting points. Sulphides with high melting points are less plastic at hot rolling temperatures and cannot be deformed readily. Rare-earth additions can effectively enhance transverse toughness so that when the Ce to S ratio is between 1.5 and 2.0, the transverse upper shelf energy approaches that of the longitudinal direction. Of the elements mentioned, Ca and rare earths are the most often used elements for improving transverse or through thickness properties. Many structural applications for HSLA steels involve cyclic loading. The fatigue behaviour of these steels therefore becomes important. In listing below, some of the fatigue characteristics of HSLA steels are compared to similar characteristics of HR low C steels. HSLA steels have fatigue properties equal or better to those of HR low C steel. Micro-alloyed HSLA steels of the three major compositional approaches (V, Nb, and Ti) have similar properties. Although the notch sensitivity is somewhat greater, HSLA steels have greater notch fatigue resistance than HR low C steels. Large plastic pre-strains tend to impair the fatigue life of both HSLA and HR low C steels, mainly the response of HSLA steels to cyclic loading at high-strain amplitudes. Tensile pre-strains are more detrimental to fatigue resistance than are compressive pre-strains for both classes of material. Most of the gains in monotonic strength achieved by work hardening are not retained under cyclic loading for either HSLA or HR low C steel. HSLA steels are generally formed at room temperature using conventional equipment. Cold forming is not to be done at temperatures below 10 deg C. As a class, high strength steels are inherently less formable than low C steels because of their greater strength and lower ductility. This reduces their ability to distribute strain. The greater strength makes it necessary to use greater forming pressure and to allow for more springback compared to low C steels. However, high strength steels have good formability, and straight bends can be made to relatively tight bend radii, especially with the grades having lower strengths and greater ductility. Further, high strength steels can be stamped to relatively severe shapes such as automotive bumper facings, wheel spiders, and engine mounting brackets. With the advent of inclusion shape control, cold formability has been substantially improved. Any grade produced with inclusion shape control can be more severely formed than a grade of the same strength level produced without inclusion shape control. Inclusion shape control enables the steel to be formed to nearly the same extent in both the longitudinal and transverse directions and is responsible for the moderately good formability of the higher strength HSLA steels. As with any steel, the bendability of HSLA steels is inversely proportional to strength and thickness. HSLA steels can be hot formed. However, hot forming usually alters mechanical properties, and a specific problem which arises in many applications is that some of the more recent thermo-mechanical processing techniques (such as controlled rolling) used for plates in particular are not suitable where hot forming is used during fabrication. This problem is bypassed by the use of a rolling finishing temperature that coincides with the hot forming temperature (900 deg C to 930 deg C). Succeeding hot forming therefore simply repeats this operation, and deterioration in properties is then small or even absent provided that grain growth does not occur. However, hot forming at these temperatures can result in steel with mechanical properties equivalent to those of annealed or normalized steel. Many producers advise against hot forming at temperatures below 650 deg C.
HSLA steels are readily welded by any of the welding processes used for plain C structural steels, including shielded metal arc, submerged arc, flux-cored arc, gas metal arc, and electrical resistance methods. Welding can usually be performed without the need for preheat or post heat. Because the C content of HSLA steels is low, these steels show hardening characteristics (in the HAZ) similar to those of plain C steels of similar low C content. They do not show the severe hardening in the HAZ which characterizes some plain C steels (those with sufficient C contents to attain YSs and TSs comparable to those of HSLA steels). Weldability generally decreases with increasing C content. For shielded metal arc welding, both mild steel covered electrodes and low H2 electrodes are used. Use of the latter is often suggested in order to preclude the need for preheating except when welding thick, highly restrained sections. Submerged arc welding is frequently preferred because of the high production rates that can be attained. However, notch toughness of the weld metal in submerged arc welds varies because of such factors as base metal composition, filler metal composition, type of welding flux, welding speed, current, voltage, and joint preparation. The choice of specific steel is often greatly influenced by its ability to be used in welded construction, with less attention being given to the influence of steel composition on weld metal composition. In a submerged arc weld, the base metal is sometimes account for as much as 50 % to 75 % of the total weld metal. Base metal composition, therefore, can have an important effect on weld microstructure. With constructional HSLA plate steels, the use of low H2 electrodes and other precautions to minimize H2 pickup is usually advised. Various electrodes are available to match base metal strength and toughness. Preheating is normally required for all thicknesses above 25 mm and for highly restrained joints. Specific preheating temperatures depend largely on the grade, thickness, and welding process used and generally ranges from 40 deg C to 200 deg C. Depending on design strength requirements for the welded joints in heat-treated alloy grades, low H2 electrodes are used. Electrodes containing V is to be avoided for any weldments which are to be subsequently stress relieved since reheating at temperatures below the critical temperature causes precipitation of VC and raises the transition temperature of the weld metal. The ductility and toughness of high strength heat treated steels depend on a tempered martensitic type of microstructure. Hence, welding heat and preheat is to be controlled so that the weld zone is cooled fast enough to retain a martensitic microstructure rather than the upper transformation products such as pearlite and ferrite which results from unrestricted high-heat inputs and slow cooling. For this reason, the high heat generally generated by submerged arc and gas-shielded metal arc welding makes these processes unsuitable when maximum joint efficiency is required in high strength heat treated materials less than 13 mm thick. Many electrode-flux combinations have been developed to produce acceptable welds with YS over 620 N/sq mm and an NDTT of about -100 deg C in both the as-welded and stress-relieved conditions. The best electrodes are based on either B-Mo-Ti alloying or, more conventionally, Ni alloying. HSLA steels gained their first use as structural shapes and plates in the early 1960s because of their ability to be welded with ease. By the early 1970s, they were also used in pipelines in both higher temperature and severe arctic conditions. Later in the 1970s, concurrent with the energy crisis, another dominant application evolved for the use of HSLA steels in order to reduce the weight of parts and assemblies in automobiles and trucks. In the 1980s, bars, forgings, and castings have emerged as applications of particular interest. For example, weldable and non-weldable reinforcement bars are available, and high strength forgings in the as forged condition are being used to replace quenched and tempered steels. Shapes such as elbows and fittings for pipelines are also being cast out of micro-alloyed steel. HSLA steels are used in a wide variety of applications, and properties can be tailored to specific applications by the combination of composition and structures obtained in processing at the rolling mill. For example, low C and closely controlled carbon equivalent (CE) values provide good toughness and weldability. Good YS and fracture toughness are the products of fine grain size. The effects of micro-alloying elements (mainly Nb, V, and Ti, but also Al and, to a lesser degree, N2) are fully exploited by such rolling mill finishing processes as controlled rolling and accelerated cooling. The scope of HSLA applications and different product forms used includes bridges, buildings, electricity towers, pressure vessels, penstocks, steel piling, railway tracks, trucks, trailers, earthmoving and mining equipment, tanks, and reinforcement bars. As a rule, it is necessary to look beyond comparative material costs to justify the use of HSLA steel. These steels almost always cost more than C steel and sometimes the alloy steel they compete with in a given application. HSLA steels typically have an edge over other materials when their unique properties allow (i) weight reductions, (ii) new or more efficient designs with improved performance, (iii) attractive reductions in fabrication/manufacturing costs, and (iv) reduced transportation costs due to weight reductions. These benefits can come in combinations, depending on the application. As an example, in automobiles, the initial advantage in substituting an HSLA grade for a mild steel part is in weight reduction. The gauge of the steel can be reduced since HSLA steel is stronger. This weight reduction not only provides improved fuel consumption but also has multiplying effects in the design when lightening one component leads to a series of weight reductions in associated parts and assemblies. In some situations, however, it is possible to justify the specification of HSLA steel on the basis of comparative material costs alone. The technique is called cost-effective weight reduction. The replacement of a mild steel part with HSLA steel is said to be cost effective when full advantage can be taken of its higher strength. Another type of benefit involves the elimination of fabrication/manufacturing operations, such as those associated with the heat treating of quenched and tempered medium C steels. For example, HSLA steels allow the production of high strength forgings without any subsequent heat treatment. By using micro-alloyed steel in the as forged condition, it is possible to eliminate quenching, tempering, straightening, and stress-relieving operations. In applications such as the forging of crankshafts or connecting rods, final savings in part costs of the order of 10 % have been gained. Another example of reducing manufacturing steps with HSLA steel involves the production of cold-headed automotive fasteners. Micro-alloyed steel wire rod replaced heat treated medium C wire. Benefits are realized before drawing and cold heading (elimination of spheroidize annealing) and after these operations (elimination of quenching and tempering). Other factors to consider in the selection of HSLA steel include the following. Formability – Limitations of micro-alloying technology in a given application can be overcome through part redesign and minor modifications in processing procedures. Notch toughness – Micro-alloying in combination with controlled rolling generally provides better toughness properties than those of HR steel. Fatigue properties – Adequate in most cases, with the possible exception being in the area of a welded joint. Weldability – It is no longer considered a barrier to usage. Machinability – At least similar and sometimes better than that of quenched and tempered steels. Control of alumina formation with Ca additions and substitutions of Al grain refinement by Nb have also been introduced. Free machining grades (with added S) are also available. Corrosion resistance – Weathering HSLA steels can provide atmospheric corrosion resistance four to eight times that of C steel, depending on the environment. H2 induced cracking and stress corrosion cracking resistance – Line pipe and pressure vessel steels have been developed with better resistance to H2S degradation. Oil and gas pipelines are a classic application of HSLA steel, and one of the first applications involved the use of acicular ferrite steel for pipelines in the Arctic Circle. The development of high strength line pipe grades has permitted the use of large diameter pipe operating at high pressure in excess of 11 N/sq mm. Grades with minimum YSs up to 490 N/sq mm in thicknesses up to 25 mm are readily available. While TS is a key requirement in line pipe, other properties are no less critical to the fabrication and operation of oil and gas pipelines. They include weldability, fracture toughness, and resistance to sour gas attack. In addition to higher strengths in larger thicknesses, HSLA steels provide better toughness, good field weldability, resistance to ductile crack propagation, and, in some cases, resistance to sour gas and oil. The girth weld is the main joining problem since it is a low heat input operation (HAZ cracking is not a problem at high welding temperature) which is carried out at high speed. The problem is overcome by taking maximum advantage of the lowest possible CE steels made possible by advanced thermo-mechanical rolling or accelerated cooling. Fracture toughness is another major requirement. The approach to avoid brittle fracture involves a combination of lower C content and fine grain size by micro-alloying along with thermo-mechanical rolling or accelerated cooling. The common technique being used to prevent the propagation of ductile cracks through a gas pipeline is to lower S content to less than 0.005 %. Low S content, in this instance about 0.002 %, also reduces reactions with sour gas and oil transported in pipelines, and Ca treatment is used to ensure that residual sulphide inclusions are of the modified round type rather than the elongated type. Also important are the elimination of all other nonmetallic inclusions, particularly oxides, and the reduction or elimination of segregation by a combination of modified casting practices at the plant and a reduction in the content of the main segregating elements, C, Mn, and P.
HSLA steels used by the automobile industry, fall into the following four major groups. Structural grades – These materials are produced by a combination of P and micro-alloying elements (mainly Nb) to develop YSs between 255 N/sq mm and 345 N/sq mm. They have a cost advantage over other HSLA grades with equivalent strength and are available in the HR or CR condition. Drawing characteristics are rated superior to those of other HSLA steels. Formable grades – Alloying elements commonly used to obtain high strength are Nb, V, Ti, or Zr. Transverse ductility is improved with Zr, Ca, or rare-earth additions by changing the morphology of sulphide inclusions. Strength levels for automotive applications vary from 275 N/sq mm to 550 N/sq mm. DP steel grades – These steels are used because of their superior formability over equivalent-strength micro-alloyed steels. Their duplex structure (ferrite and martensite) gives them a high strain hardening capability. YSs range is from 275 N/sq mm to 550 N/sq mm. Experience in the application of CR and HR HSLA sheet in automotive uses indicates the importance of additional requirements with respect of stiffness, crash behaviour, fatigue life, corrosion resistance, acoustic properties, and, of course, formability and weldability. The function of the automotive part is also important in determining whether or not the application of HSLA steels is feasible. For applications in which YS is the major consideration, as in door beams and bumper beams, the efficient use of HSLA is made, and weight savings of 40 %to 60 % are possible when substituting, HSLA grades for mild steel. However, for other parts, such as outer body panels, which are also subjected to bending and/or buckling, stiffness is more important than YS. Part geometry and modulus of elasticity, the latter of which is the same for mild steel and HSLA steel are the key factors. In such instances, an economic case cannot be made for using HSLA steel. However, through component redesign, such as adding beads or ribs to upgrade stiffness properties, the performance of the part may be improved and allow the efficient use of a higher strength HSLA grade. In addition to improvements in fuel consumption through weight reduction, benefits are found in increasing payloads without a change in fuel consumption. Specific applications here include trucks, rail cars, off-highway vehicles, and ships. Ship applications of HSLA, however, are also limited by buckling and stiffness considerations. The essential characteristics of steels for offshore applications include YSs in the region of 350 N/sq mm to 415 N/sq mm, good weldability, high resistance to lamellar tearing, lean composition to minimize preheating requirements, high toughness in the weld heat-affected zone, and good fracture toughness at the designated operating temperatures. Some of these requirements have been realized through a reduction in impurities such as S, N2, and P in the steelmaking process for conventional steels. A major challenge, however, is to reduce CE to improve weldability while still maintaining strength. Controlled rolling and accelerated cooling of Nb steels has also allowed reductions in C contents, which can be further reduced when accelerated cooling is employed. Many offshore structures have been built using normalized C-Mn-Nb steel. Advances in automation and control and rolling capability have led to the development of thermo-mechanically controlled processes that produce steels with higher strength, high fracture toughness, improved weldability, and lower cost. Thermo-mechanically controlled processes combine controlled rolling and accelerated cooling (with controlled water sprays) or direct quenching to room temperature. Very fine-grain steel is produced. These steels are characterized by low C content (usually less than 0.10 % C), which makes them less susceptible to increases in hardness caused by rapid cooling rates between 425 deg C to 260 deg C during welding. Potentially, these steels can be welded with little or no preheat. Two approaches have been taken to eliminate lamellar tearing. One is to reduce S to levels below 0.008 %, while the other involves modification of the sulphide shape. The latter relies on the addition of Ca or rare-earth metals to form spheroidal calcium or rare-earth sulphides. This approach usually results in both the elimination of lamellar tearing and an improvement in transverse impact properties. Both S reduction and sulphide shape control are frequently used to eliminate lamellar tearing. Ca treatment is preferred for sulphide inclusion shape control. In using continuously cast steels, centerline segregation is also a concern. The approach favoured by users is to minimize segregation through steelmaking practice and to minimize the use of elements (C, Mn, S, and P) known to segregate easily during solidification. Soft, in-line reduction practices have been introduced. Users also specify minimum steel soaking time and temperature to control centerline segregation. The attraction of HSLA in the case of cold forming strip, particularly in automotive applications, is to make lighter parts by reducing gauge requirements. Formability is a problem that is dealt with in many ways. Welding is not as much of a problem with CR strip as it is with plate. Generally, welding problems are dealt with through the process itself or with surface treatments, rather than with modification of the fundamental characteristics of the steels themselves. The cold forming strips are normally produced in the HR or CR rolled and annealed condition. Because of their limited formability, they are typically used for structures and reinforcement parts for automobiles, buildings, and various domestic equipments. Solid-solution strengthened steels have better formability than precipitation-strengthened grades. The most common alloying elements in this instance are Mn, Si, and P. When P is above 0.10 %, it tends to present problems in electric resistance welding. Solution-strengthened steels can be used in automotive body panels. These steels can be further strengthened by the addition of a small percentage of Nb. Bake-hardened grades are of interest because they are formed at a low strength level and subsequently strengthened during the paint-baking operation, at about 170 deg C. Advantage is taken of the quench aging mechanism. C is quenched into solution at the cooling rates obtained after batch or continuous annealing and is later precipitated during the paint-baking operation. Transformation-strengthened HSLA steels include DP steels in which the second phase can be martensite, bainite, or pearlite, depending on the strength requirements. These steels have good formability and weldability. They are used extensively in rolled form. The highest strength strip with YSs up to 1600 N/sq mm are alloyed to ensure transformation to martensite. Applications include door impact beams and rear bumper supports. The formability of these steels is limited. Corrosion protection is of concern since the corrosion resistance of non-weathering HSLA steel is not significantly different from that of other steels. In this case, a number of coatings that inhibit corrosion and enhance the appearance of automobiles and buildings are available. They include zinc galvanized and aluminized coatings, which are applied by hot dip or continuous processes. A variety of colored organic coatings are also available. Nb, V, and Ti micro-alloy additions are used for structural steels, and Cr and Mo are added for higher temperature service. Processes used include controlled rolling, normalizing, quenching and tempering. For rolled shapes, direct accelerated cooling from the rolling temperature is a recent pracice. Steel frames for buildings are expected to be competitive with other building construction materials, including pre-stressed concrete. Benefits include an increase in the load bearing capacity of columns, weight savings, and gains in space. Composite construction (HSLA rolled sections and reinforcement bar bonded together with concrete) also appears to have potential. These composites offer great strength in compression, high building strength, and good resistance to fire. Ship applications are limited by buckling and stiffness considerations. Growth in usage of hull plate is apparently held back by the fact that since HSLA and mild steel have the same elastic modulus, reducing thickness lowers elastic rigidity. This has caused concern regarding potential problems with hull rigidity. One of the main challenges in this application area has been to reduce the need for welding preheats in the most common hull plate thicknesses. There are some exceptions to this. Crane and vehicle applications include trucks tankers, mobile cranes, dumper trucks, and heavy-duty material handling equipment. Important properties include strength and toughness, resistance to brittle fracture, fatigue strength, weldability, and formability. In crane construction, high minimum YSs are needed to obtain high load-bearing capacities to handle dead loads. Acceptable brittle fracture properties are obtained, for example, with acicular ferrite steel. Resistance to cyclic loading is extremely important; in particular the fatigue strength of welded joints which is typically not as strong as that of the base steel because of microstructural changes due to the heat from welding. Improvements can be realized through post weld treatments. In using controlled rolled grades, heat input is to be limited because of the likelihood of softening in the HAZ during welding. Micro-alloyed HSLA steels used in commercial vehicles are typically cold formed. Good forming properties in the longitudinal and transverse directions are required when thermo-mechanically rolled steels are used. The desired result is obtained by optimizing sulphide shape control by the addition of Ca and Ce. The high strength steels for railway tank cars are defined by minimum YS of 350 N/sq mm and TS of 490 N/sq mm. Bars, forgings, and castings have emerged as the latest area of opportunity for micro-alloyed HSLA steels, and there has been rapid assimilation of the technology developed in other product areas. In particular, the search for higher strengths, elimination or reduction of heat treatments, simplified cold finishing or machining operations, and improved toughness have been combined with a simultaneous concern for other end-use properties such as toughness, machinability, and weldability. The result has been an integrated approach, including the proper selection of microstructure and transformation conditions, the application of thermo-mechanical processing and control of deoxidation and solidification practices. C contents range from 0.05 % in weldable castings and acicular ferrite bar used in cold heading to 0.60 % for spring steels and high-strength wire. Tensile strengths range from 600 N/sq mm to 2000 N/sq mm and higher. Micro-alloying is used to satisfy a wide variety of metallurgical and manufacturing objectives, such as the substitution of as rolled or as forged steels for parts that required heat treatment for the improvement of toughness, fatigue behaviour, machinability, or response to cold rolling. Examples of how micro-alloying is used in combination with processing to develop of improve specific properties follow. Vanadium is generally used when it is necessary to develop hardening in conjunction with low austenitizing temperatures, but it is often necessary to add Ti, which prevents grain growth during high temperature forging applications. For normal high temperature rolling conditions, higher levels of precipitation strengthening in V (and/or Nb) steels may have a detrimental effect on toughness. When controlled rolling is used in combination with Nb (0.03 % to 0.08 %) or extra low C content, toughness improved dramatically, and the properties of Nb steels are superior to those obtained in V steels. Niobium is added to improve the toughness of as-forged components. Such steels are widely used for automobile components. Nb containing steels are accepted for safety related parts such as steering knuckles and suspension components. Niobium and/or vanadium are also added to HR C-Mn steel bars to effect grain refinement and improve toughness. In case of medium C and Low C micro-alloyed bars, V and Nb act as precipitation strengtheners. Medium C (0.40 %) steels are used widely in concrete reinforcement bars. If enhanced toughness is needed for low temperature service conditions or if weldability is a problem, C is reduced to the 0.10 % to 0.20 % range, maximizing the contribution of micro-alloying, rather than pearlite, in the strengthening process. Further improvements are available through controlled rolling. However, low C bainitic micro-alloyed steels appear to have better potential for replacing high strength high toughness quenched and tempered steels than do medium C micro-alloyed steels. Medium C micro-alloyed steels are not ideal candidates for using the benefits of micro-alloying technology because their C contents and precipitation strengthening effects contribute to poor notch toughness. Low C steels micro-alloyed with ferrite-bainite microstructures show a better combination of strength and toughness properties. .
Micro-alloying of C-Mn steel bars can increase the strength of steel bars (0.35 % to 0.45% C) used to reinforce concrete. Recent applications call for improvements in bendability, weldability, and toughness for low ambient service temperatures or for low temperature structures, such as refrigerated warehouses, liquid natural gas storage facilities, foundations for nuclear power stations, and construction in seismic prone areas. For these conditions, C content is lowered, and the strengthening properties of Nb and V are used singly or in combination. Micro-alloying elements as a substitute for Al in grain refinement facilitate the production of desired inclusion compositions for applications in which machining or surface treatments such as carburizing or nitriding are involved. Such steels are designed to decrease the abrasive tool wear caused by hard alumina inclusions. Deoxidation practice produces soft, glassy inclusions that are relatively plastic at hot working temperatures. The elimination of Al requires the use of another strong deoxidant such as Ca and the addition of Nb or other suitable grain refiner. Niobium or vanadium containing castings have many applications. Large castings, for example, are used in offshore construction. Built-in reinforcements improve performance under cyclic loading conditions. Many low C steels have inherently high ductility and can tolerate the presence of some potentially injurious second phase particles such as carbide eutectics. Nb and Nb-V micro-alloyed low C steels with Mn and Mo have been developed and applied. Castings are used in either the as cast or as quenched and tempered condition. In either case, weldability is reported to be excellent. A development for the future is the low C (0.02 %) Mn- Nb –B- Ti steels, originally developed as high heat input filler (weld) metals. Large amounts of CR HSLA sheet and strip are produced. However, because many applications of CR steel already involve thin product forms, substituting thinner, stronger steel for weight savings cannot be feasible because of stiffness and deflection considerations. The general types of CR HSLA steels utilize precipitation strengthening, solid-solution strengthening, or strengthening from a DP (martensite in ferrite) microstructure. The CR solution-hardened steels have superior elongation and stretchability compared with CR precipitation-strengthened steels of the same tensile strength, but is limited to TS of around 600 N/sq mm. The CR precipitation-strengthened steels allow higher TSs compared with solution-strengthened steels, but these have less ductility at a given TS. Because Ti provides sulphide shape control and precipitation strengthening, Ti steels have plastic-strain ratios up to 1.4 at TSs of 550 N/sq mm to 650 N/sq mm. DP steels offer improved ductility at higher TSs. Sheets of DP steel have very low YSs without sharp yield points (that is, continuous yielding), but the YSs are increased substantially during forming or by a tempering or aging treatment at 300 deg C to 400 deg C for about 5 min after air cooling. Although many of the high-strength CR steels have rather low plastic-strain ratios and, hence, are not deep drawn as readily, their drawability can be improved by a suitable pre-coating lubricant. The deep drawing properties of the IF steels are excellent.